Each dental exam assesses your oral and periodontal health, including an oral cancer screening and TMJ assessment. X-rays assist us in identifying conditions that are not visible during the clinical exam. We recommend scheduling an exam every six months. 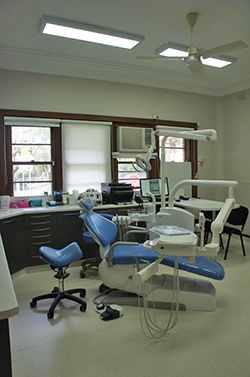 The ADA reports that approximately 16% of all Australian adults have a high fear of dental care. Our patients have the option of choosing inhaled nitrous oxide sedation during their appointment. Nitrous oxide is useful for overcoming anxiety and discomfort related to their dental treatment. Dental cleanings every six months remove tartar deposits from the teeth, keeping the teeth and gums healthy. Uncontrolled tartar deposits can lead to gum disease, a condition that causes bone and tooth loss. We also apply a professional fluoride treatment to supplement tooth remineralisation for decreased decay and sensitivity. Our white composite or metal fillings are used to repair teeth that have been damaged by cavities or trauma. Composite fillings are matched to the colour of your natural tooth. Porcelain and gold inlays or onlays are also available if the damaged site is too large for a traditional filling. Both full and partial dentures are useful for replacing missing teeth. They are made of resin materials with or without metal, and held in place by your natural oral anatomy. In some cases, dental implants may be used to support a full denture. If a tooth is too decayed, fractured or impacted by gum disease, it may be beyond salvageable. In these cases, we recommend removing the tooth before it can impact the health of the teeth around it. Our extraction services are also sometimes required for orthodontic therapy. If the nerve of your tooth has been damaged or infected (such as an abscess or history of trauma,) then a root canal can preserve the tooth. A root canal involves removing the nerve tissues and sealing the chamber and canal inside of the tooth. Most root canal procedures are followed by a crown. If you are at an increased risk of dental wear or trauma due to athletic activities, grinding or clenching, then a protective guard could save your smile. Our custom-fitted oral guards and splints will stay in place when you need it most.